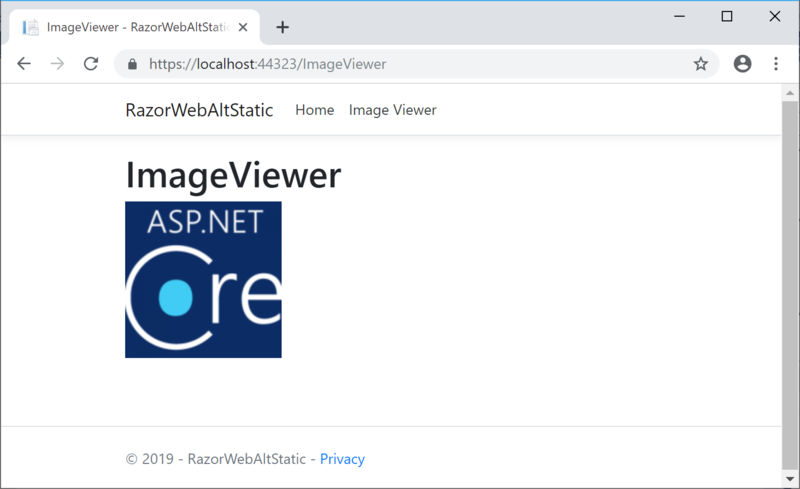 This article will teach you how to include and customize the use of static files in ASP .NET Core web applications. It is not a tutorial on front-end web development. When you create a new web app using one of the built-in templates (MVC or Razor Pages), you should see a “wwwroot” folder in the Solution Explorer. This points to a physical folder in your file system that contains the same files seen from Visual Studio. However, this location can be configured, you can have multiple locations with static files, and you can enable/disable static files in your application if desired. In fact, you have to “opt in” to static files in your middleware pipeline. Let’s start by observing the Startup.cs configuration file. We’ve seen this file several times throughout this blog series. In the Configure() method, you’ll find the familiar method call to enable the use of static files. This call to app.UseStaticFiles() ensures that static files can be served from the designated location, e.g. wwwroot. It’s useful to note the placement of this line of code. It appears before app.UseMvc(), which is very important. This ensures that static file requests can be processed and sent back to the web browser without having to touch the MVC middleware. This becomes even more important when authentication is used. In the code below, you can see the familiar call to app.UseStaticFiles() once again. However, there is also a call to app.UseAuthentication(). It’s important for the authentication call to appear after the call to use static files. This ensure that the authentication process isn’t triggered when it isn’t needed. By using the middleware pipeline in this way, you can “short-circuit” the pipeline when a request has been fulfilled by a specific middleware layer. If a static file has been successfully served using the Static Files middleware, it prevents the next layers of middleware (i.e. authentication, MVC) from processing the request. It may be convenient to have the default web templates create a location for your static files and also enable the use of those static files. As you’ve already seen, enabling static files isn’t magic. Removing the call to app.useStaticFiles() will disable static files from being served. In fact, the location for static files isn’t magic either. Behind the scenes, this method call sets the “content root” to the current directory, which contains the “wwwroot” folder, your project’s “web root”. These can both be customized. To change the content root, you can configure it while building the host, e.g. To change the web root within your content root, you can also configure it while building the host, e.g. You may also use the call to app.UseStaticFiles() to customize an alternate location to serve static files. This allows you to serve additional static files from a location outside of the designated web root. In the call to Path.Combine(), the “AltStaticRoot” is an actual folder in your current directory. This Path class and its Combine() method are available in the System.IO namespace. The “AltStaticFiles” value for RequestPath is used as a root-level “virtual folder” from which images can be served. The PhysicalFileProvider class is available in the Microsoft.Extensions.FileProviders namespace. The screenshot below shows an example of an image loaded from an alternate location. The screenshot below shows a web browser displaying such an image. When you use a CDN (Content Delivery Network) to serve common CSS and JS files, you need to ensure that the integrity of the source code is reliable. You can rest assured that ASP .NET Core has already solved this problem for you in its built-in templates. Right away, you’ll notice that there are two conditional <environment> blocks in the above markup. The first block is used only during development, in which the bootstrap CSS file is obtained from your local copy. When not in development (e.g. staging, production, etc), the bootstrap CSS file is obtained from a CDN, e.g. CloudFlare. You could use an automated hash-generation tool to generate the SRI (Subresource Integrity) hash values, but you would have to manually copy the value into your code. You can try out the relatively-new LibMan (aka Library Manager) for easily adding and updating your client-side libraries. The easiest way to use LibMan is to use the built-in features available in Visual Studio. Using LibMan using the IDE is as easy as launching it from Solution Explorer. Specify the provider from the library you want, and any specific files you want from that library. In any case, using LibMan will auto-populate a “libman.json” manifest file, which you can also inspect and edit manually. What About NPM or WebPack? It’s good to be aware that LibMan is a not a replacement for your existing package management systems. In fact, the Single-Page Application templates in Visual Studio (for Angular and React) currently use npm and WebPack. LibMan simply provides a lightweight mechanism to include client-side libraries from external location.